When busi­ness­es hire me to help grow their fol­low­ers on Insta­gram or Face­book they are doing this because they under­stand the val­ue of hav­ing the eye­balls of qual­i­ty poten­tial clients or cus­tomers view their posts. They cor­rect­ly under­stand that it’s not the quan­ti­ty but the qual­i­ty of their fol­low­ers that will ulti­mate­ly trans­late to dol­lar signs and make their invest­ment worth­while. Once in a while a client asks me if it’s worth it to buy fol­low­ers. 1) They are impa­tient and want fast results. 2) They are con­cerned about their com­peti­tors who have more fol­low­ers than them and want to appear more suc­cess­ful. 3) They believe the high­er the num­ber the more impor­tant and rel­e­vant they look and this will lead to more busi­ness. My answer to those clients ask­ing whether to buy or not to buy is always an unequiv­o­cal no. It’s a very bad idea to buy fol­low­ers and here’s why. When you buy fol­low­ers or fans, you aren’t get­ting peo­ple who are inter­est­ed or will­ing to engage with you. You are mere­ly buy­ing num­bers. 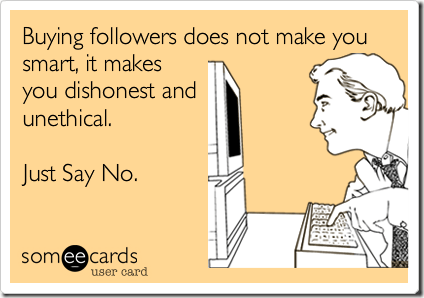 After pay­ing for followers/fans you are like­ly to get a large num­ber of fake accounts amongst your num­ber. This means that while you appear to have a lot of fans, very few peo­ple will like and com­ment. More impor­tant­ly none of your non qual­i­ty (most­ly fake) fol­low­ers will trans­late to busi­ness. In fact, adding in fol­low­ers that don’t inter­act with your account reduces the per­cent­age of engage­ment you will get. On some plat­forms, like Face­book, this will work against you. Face­book has a fan­cy algo­rithm it uses to decide what brand con­tent it will fil­ter to the news feed. Hav­ing a dwin­dling engage­ment rate tells this algo­rithm that your fol­low­ers aren’t inter­est­ed in your posts. So they will allow few­er of your posts into the news feed organ­i­cal­ly. Which means you have to buy more ads to reach your fol­low­ers. Some ser­vices you buy fol­low­ers from are extra shady beyond just sell­ing you fake fol­low­ers. Since they have access to your account, they can spam your fol­low­ers with ads for their ser­vice, or any­thing real­ly. Great for them! Not so much for you or your fol­low­ers. In fact a lot of peo­ple are cur­rent­ly get­ting found out. A new tool on the block is mak­ing it even eas­i­er. The Fake Fol­low­ers Check check from Sta­tus peo­ple analy­ses your fol­low­ers to see how many are fake. The inter­est­ing thing is you can do the analy­sis on oth­er accounts too. In addi­tion peo­ple are smart. 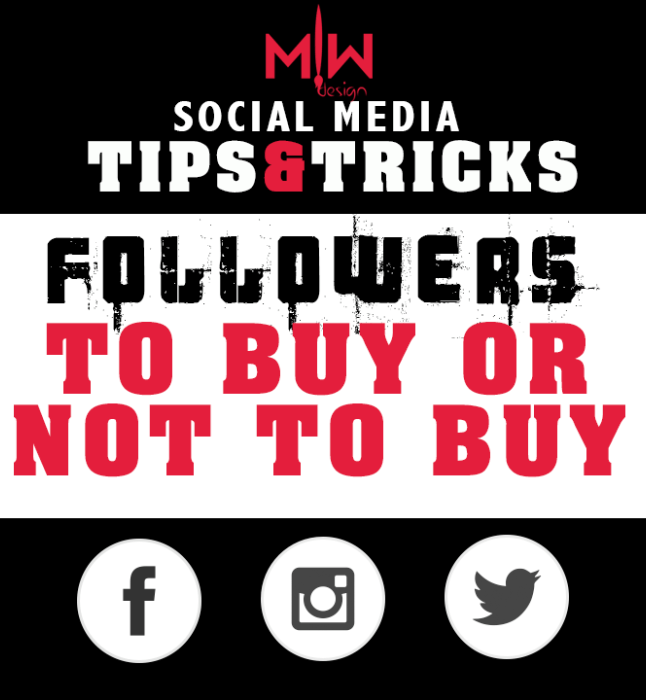 When they see 30,000 fol­low­ers but under 100 likes on a post, they know some­thing is fishy. When they see most of your fol­low­ers are for­eign­ers or dodgy, they know some­thing is up. And the moment they sus­pect that you inflat­ed your num­bers, you are back to issue #2…loss of rep­u­ta­tion. So what is the main les­son? Well apart from it being immoral to buy your fol­low­ers, the num­ber of fol­low­ers you have real­ly isn’t that impor­tant. Work on build­ing a com­mu­ni­ty of peo­ple who are inter­est­ed in you or your product/service. If you fol­low this for­mu­la you will most cer­tain­ly suc­ceed. SO HOW DO YOU GET QUALITY FOLLOWERS? You can start by hir­ing a pro­fes­sion­al with a proven track record to get you start­ed. There are many incred­i­ble tips and tricks that legit­i­mate­ly attract peo­ple who want to fol­low you. Be it con­tests, boost­ing posts, hash­tags, pro­vid­ing qual­i­ty posts, being active on social media and engag­ing with cus­tomers etc. At MLWDESIGN, I pre­fer to get you start­ed and train you to run your own social media because I firm­ly believe there is no one who can do a bet­ter job rep­re­sent­ing you, then you. Be wary of com­pa­nies who claim they can boost your fol­low­ers fast…they are often get­ting you fake fol­low­ers too! Build­ing a brand on social media isn’t about get­ting more fol­low­ers than every­one else, it’s about get­ting into a niche mar­ket and build­ing con­nec­tions with real peo­ple that appre­ci­ate your prod­uct and—most impor­tant­ly—are will­ing to spend mon­ey on it. Inter­ac­tion with your fol­low­ers is the best way to learn about your audi­ence as well. Cre­at­ing a qual­i­ty fol­low­er base takes hard work—work that will pay off in actu­al dol­lars and cents if you give it the time it needs. It may seem daunt­ing at first, but with a lit­tle plan­ning, and some elbow grease you will get you the followers—and customers—of your dreams and main­tain your integri­ty.